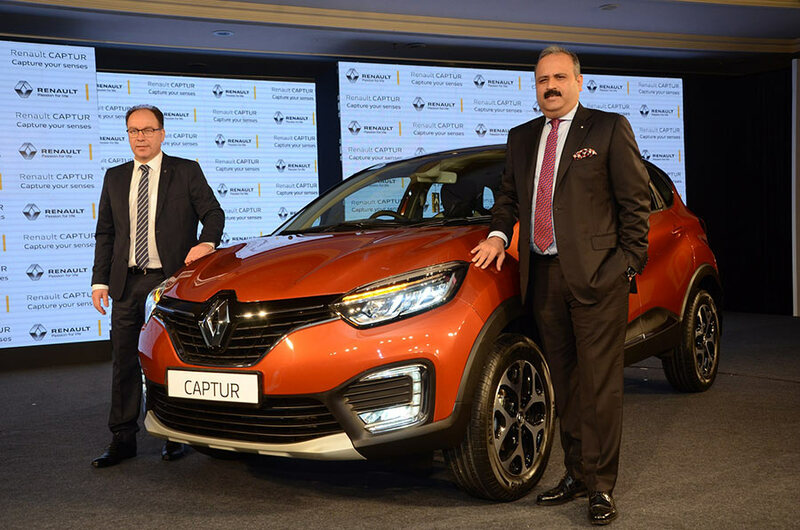 French automaker Renault has launched the much awaited Renault CAPTUR SUV today in one of its growing market – India. This Stylish SUV by Renault has been launched at an attractive introductory price of Rs 9.99 Lakhs. With its stunning design which represents Renault’s new design DNA, Renault CAPTUR delivers on our promise of bringing the best from Renault’s global product range to India. Its expressive design is enhanced by premium & class-leading features and the high levels of personalization that can be achieved to best suit the customers’ preferences. Together with launching products of global repute, it is important to have a strong ‘India strategy’, offering customers a compelling value proposition. 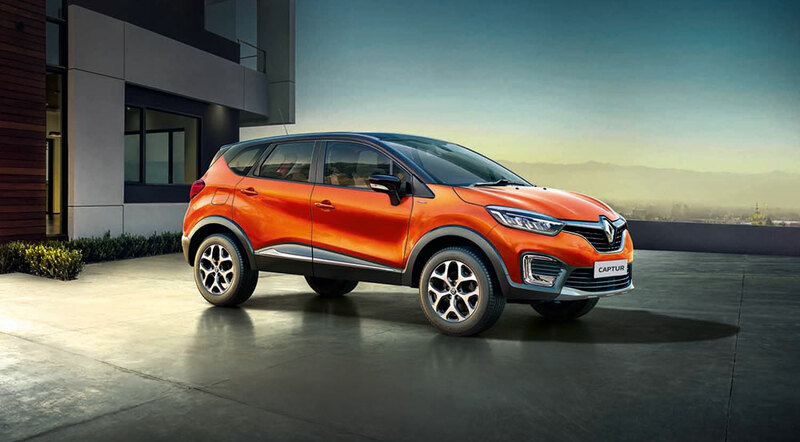 Renault CAPTUR will set new benchmarks with its global styling and unmatched road presence, further strengthening our position in the burgeoning SUV segment. 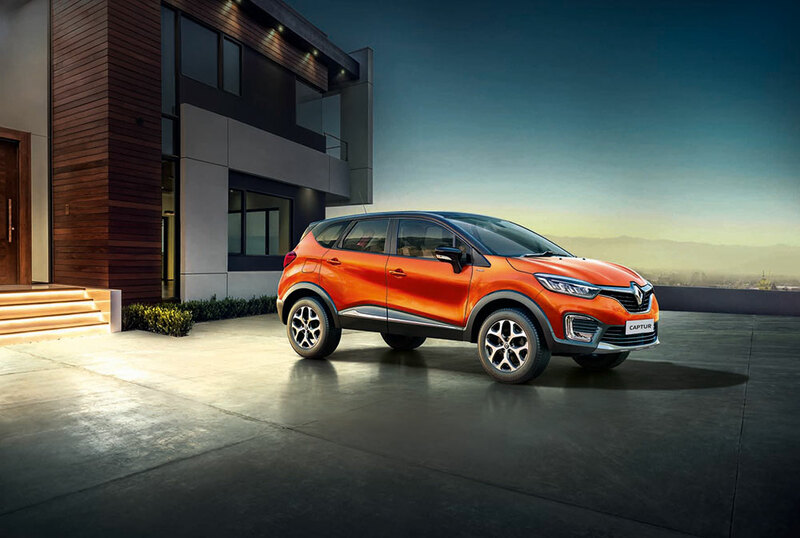 Renault CAPTUR has a stunning crossover French design clearly reflecting Renault’s new design DNA. With a design language that is strongly agile and powerfully expressive, Renault CAPTUR brings forth the best from the world of Renault in terms of style and designing, in line with Renault’s recent product introductions in India. Together with its global styling cues, the designing of Renault CAPTUR also accounts for Indian conditions and consumers’ preferences, with Renault CAPTUR being the widest and longest offering in its category, with best-in-class ground clearance of 210mm. This is well matched by an elevated driving position that offers wraparound panoramic visibility, which sets a new benchmark for comfort. Renault CAPTUR comes loaded with more than 50 premium features as standard offerings from the starting variant onwards. These include projector headlamps, C-shaped Sapphire LED DRLs, fully automatic temperature control with rear cooling vents, integrated audio system with USB & Aux-in and Bluetooth®, steering wheel controls, push- button start with remote central locking, dual airbags, Antilock-Braking System (ABS) with Electronic Brake Distribution (EBD) & Brake Assist and rear defogger with wiper. 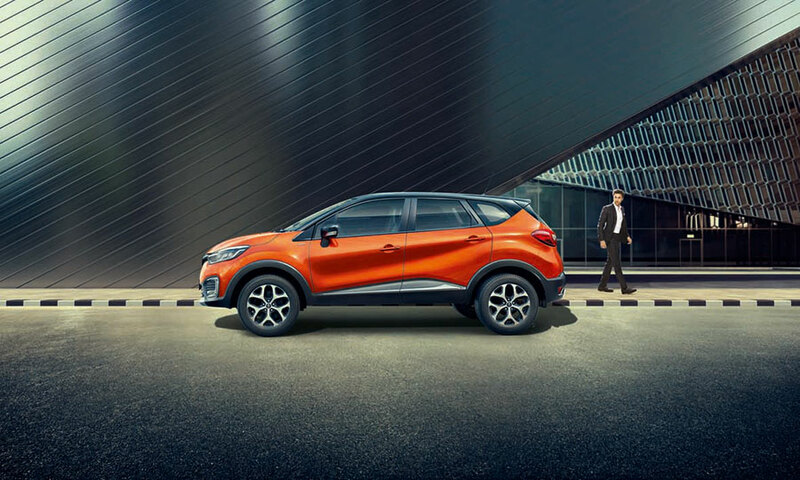 Renault CAPTUR delivers the next level of drive experience enabled by the OneIntegration concept, Renault’s design approach that seamlessly connects car and driver. Renault CAPTUR is equipped with modern hi-tech solutions which makes driving comfortable and pleasant. These include the smart access card, the Infinity Instrument Cluster enabling a complete cockpit experience, a user-friendly new generation Intelligent ULC 3.0 multimedia navigation system with a seven-inch display, voice recognition (for iOS), maps along with temperature and time display. Another highlight is the top-end Renault CAPTUR PLATINE which makes its debut in India. ‘Platine’ is the most premium version across Renault cars, used discerningly for very exclusive offerings. The global-first, exclusive CAPTUR PLATINE features ultra-premium white and gold interiors and takes the feel of sophistication a notch higher with AC vents engulfed in chrome, along with the stylish bezel with golden finish. Its ErgoDesign leather seats are engineered to set a new benchmark in comfort, and are 6-way adjustable. Renault CAPTUR will be available with both petrol and diesel powertrain options. For the petrol option, it will be powered by the 16 valves 4 cylinder 1.5L H4K petrol engine mated to a 5 speed manual gear box, producing 106 PS at 5,600 rpm and 142 Nm of torque at 4,000 rpm. The petrol powertrain delivers a mileage of 13.87 kmpl (ARAI certified). The diesel version will be powered by the 1.5L K9K diesel engine (common rail injection), mated to 6 speed manual gear box, delivering a maximum power of 110 PS at 3,850 rpm and peak torque of 240 Nm at 1,750 rpm. 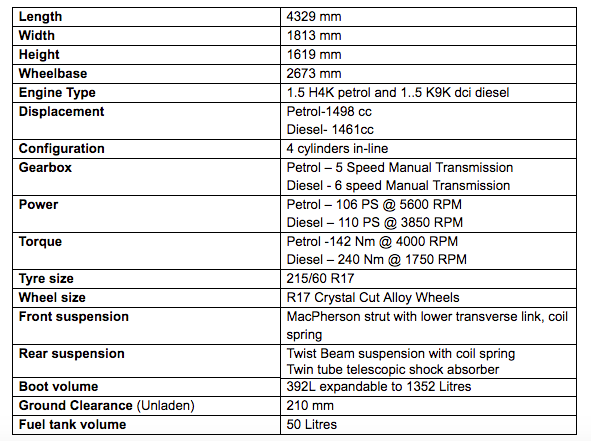 The diesel powertrain delivers a mileage of 20.37 kmpl (ARAI certified). Renault CAPTUR will be available in 3 variants with both petrol and diesel powertrain options. In addition, the exclusive PLATINE variant will be available in a diesel option. 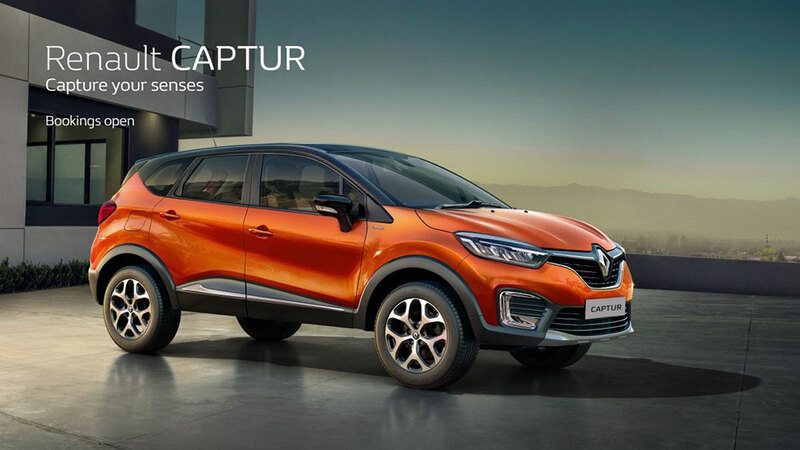 Renault CAPTUR takes innovative exclusivity to a completely different level with more than 40 personalization categories. Every aspect of the car has been designed keeping this in mind, and CAPTUR will come with a wide range of fashion-inspired dual tone roof styling. The 7 exclusive fashion-inspired dual tone combinations include Cayenne Orange body with Mystery Black roof, Pearl White body with Mystery Black roof, Mahogany Brown body with Mystery Black roof, Cayenne Orange body with Marble Ivory roof, Mahogany Brown body with Marble Ivory roof, Pearl White body with Planet Grey roof and Mahogany Brown body with Planet Grey roof. The 5 exciting monotone body colour options for Renault CAPTUR includes Cayenne Orange, Pearl White, Planet Grey, Moonlight Silver and Mahogany Brown. Interior finishes of the car are also modern and innovative. While PLATINE is designed with plush white and gold interiors, customers will have options of sporty anodized blue pacifique or rouge passion accents on the air vents and center console in the RXT variant. CAPTUR can be further enhanced with 16 different roof decal designs. Renault will also offer the option of further enhancing both the car’s interior and exterior with 2 innovative themed personalization packs – Diamond Deck and Urban Connect, which are the result of a collaboration between Renault’s design studios in India and France. All these are further enhanced by more than 120 aesthetic and utility add-ons like chrome embellishments, smart lighting enhancements, illuminated scuff plates, roof decal designs and designer mats. Safety is of paramount importance for Renault, and CAPTUR is certified to exceed frontal and lateral crash test parameters. With a reinforced body for optimum safety, Renault CAPTUR is equipped with a host of active and passive safety features across all variants including dual airbags, Antilock-Braking System (ABS) with Electronic Brake Distribution (EBD) & Brake Assist, rear defogger, rear wiper & washer, 2 lateral ISOFIX – child seat anchor, height adjustable seat-belts and speed sensing auto door lock. Additionally, Renault will offer side airbags, Electronic Stability Control (ESC) and Hill Start Assist, Cruise Control with Speed Limiter, LED front fog lamps with cornering function, auto head lamps and rain sensing wipers. The launch of CAPTUR is well supported by Renault’s aggressive network expansion plans, both from a sales and service perspective. In a short span of time, Renault has grown its presence rapidly in India, becoming one of the youngest and fastest growing automotive brands and the number one European brand. Along with a progressive product expansion plan, Renault has laid a firm plan to aggressively expand its network reach across India. From a modest presence of 14 dealership outlets in May 2011, Renault India expanded its pan-India dealership network to more than 300 dealership outlets so far, making it one of the fastest network ramp-ups by an automobile brand in India. 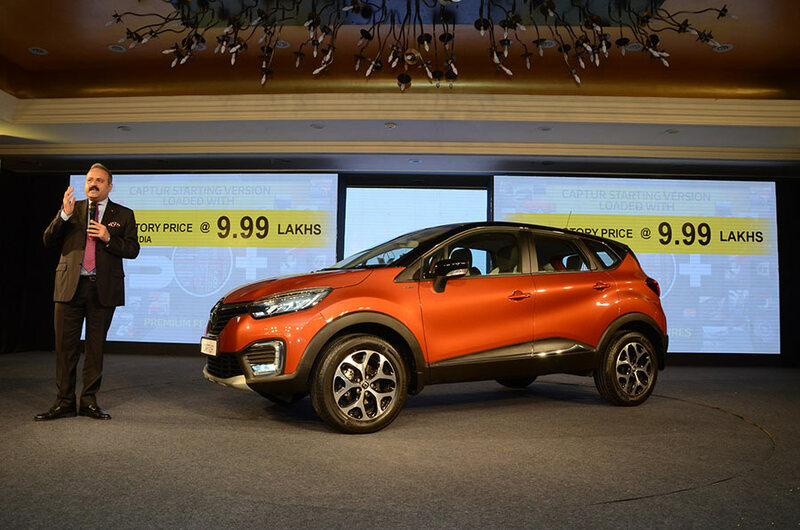 Renault aims to reach to 320 dealerships by the end of 2017 and its growing network presence will make Renault products and services, including Renault CAPTUR, more accessible to customers across the country.